You might want to create a Wi-Fi access point at home or at work, but you may not have a router that offers this possibility, and you don't want to spend the money that a new router would cost you. This will no longer be a problem thanks to Maryfi. Create a Wi-Fi network with your computer. 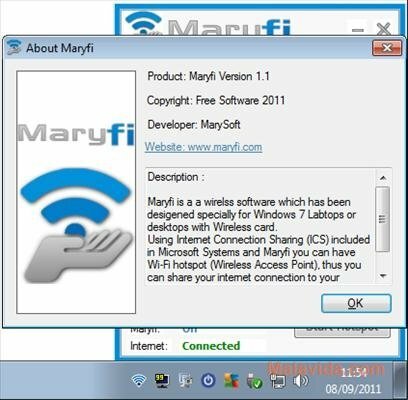 Maryfi is a lightweight application designed for Windows 7 that transforms the Wi-Fi card of a desktop computer or a portable into a Wi-Fi access point. Thanks to this application you will be able to use the connection power offered by a cable connection or a mobile phone to offer connectivity to nearby Wi-Fi devices. Another thing that Maryfi can be used for, is to use the Wi-Fi card of a computer to expand the influence area of a router, because depending on the area you need it to affect, it may be possible that the router signal can't cover the entire area. Maryfi is so easy to use, that creating a Wi-Fi area will be really simple, you'll only need to input the name of the future network and the password necessary to access it and start broadcasting this signal. 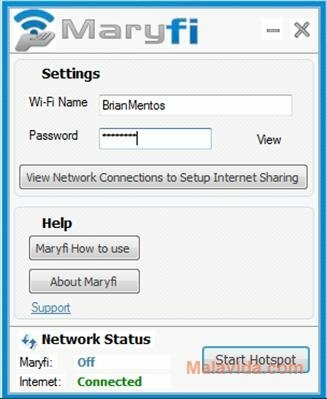 Download Maryfi and create your own Wi-Fi network. This download requires a computer with a Wi-Fi card and that you have Microsoft Virtual Wi-Fi installed. This download requires the Windows 7 operating system.